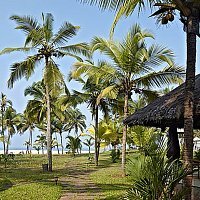 Here at The Hermitage we are fortunate to have the opportunity to practice yoga in the most beautiful and tranquil natural surroundings: surrounded by graceful coconut palms and cooled by balmy breezes from the Arabian Sea. All our packages take advantage of this delightful setting by including a ‘Tuning into Nature’ session that includes a guided meditation built into a walk along our beach. Our teacher is Shri Anil Kumar, who has been teaching classical Hatha Yoga (Ashtanga Yoga School) for eleven years. Anil has a postgraduate diploma in Yoga Therapy (PGDYT) from SVYASA Yoga University Bangalore; a diploma in Yogic Science & Indigenous Health Care (DYS) from Kannur University and a diploma in Yogic Science & Naturopathy (DNYS) from New Delhi. He has also taken a Yoga Vedanta course from the Yoga Vedanta Forest Academy in Rishikesh. His emphasis is always on ease and naturalness, so that the body is cultured and the nervous system refined of its impurities in a gradual and systematic way. 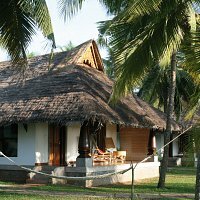 Our yoga classes take place in the Patanjali Yoga Hall overlooking the beach. The building is built of wood and stone and is light, spacious and airy. It sits at the south of the plot offering fine views of the ocean while providing a calm and tranquil atmosphere lulled by the sound of the waves. We offer three packages running for 5, 7 or 12 days and are always happy to tailor these to your particular requirements. The package includes: Loosening-up exercises; breathing exercises (pranayama); classical yoga postures (asanas) and relaxation techniques. Accommodation, airport transfers, vegetarian meals in Annapurna restaurant and one 45 min body massage. In each case, the level will be tailored according to the experience and needs of the participants. A personal ‘Home Programme’ will also be given to each student when they leave.